Every year I ask the Lord for a verse. In 2012, He gave me Isaiah 55:12. “For you shall go out in joy and be led forth in peace; the mountains and the hills before you shall break forth into singing, and all the trees of the field shall clap their hands” (ESV). The previous couple of years had been challenging to say the least, and I yearned for renewed joy and peace. I claimed Isaiah 55:12 with no idea how God would bring it to pass. He was true to His word and eventually led me into this place of joy and peace. Our vacation in the national forest of Colorado brought all this to mind, as quaking aspen and gurgling streams reminded me of God’s faithfulness. After three years, we’re once again camped in our 5th wheel trailer. My husband is an excellent fly fisherman and I enjoy photography. We delight in watching humming birds compete for a place at the feeder. There’s time for walking, reading, poking burning logs in the fire pit, and meaningful conversation. We drove one of the “improved roads” up from our camp. 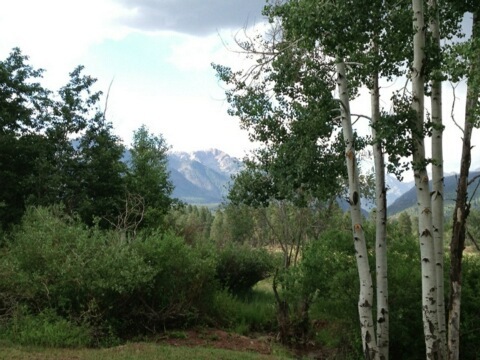 The picturesque 10,000-foot mountain surpassed our expectations of beauty and fun. I couldn’t help but think of Romans 1:20. “For since the creation of the world God’s invisible qualities—his eternal power and divine nature—have been clearly seen, being understood from what has been made, so that people are without excuse” (NIV). How can anyone witness the grandeur and beauty of creation and not recognize the Creator? Isaiah 61 gives those trapped in physical, emotional, and mental affliction reason to clap and sing. Jesus proclaimed Isaiah 61:1-2 spoke of Him. And the scroll of the prophet Isaiah was given to him. He . . . found the place where it was written, “The Spirit of the Lord is upon me, because he has anointed me to proclaim good news to the poor. He has sent me to proclaim liberty to the captives and recovering of sight to the blind, to set at liberty those who are oppressed, to proclaim the year of the Lord’s favor.” And he began to say to them, “Today this Scripture has been fulfilled in your hearing” (Luke 4: 17–19, 21 ESV). Isaiah 61 continues, “To grant to those who mourn in Zion— to give them a beautiful headdress instead of ashes, the oil of gladness instead of mourning, the garment of praise instead of a faint spirit; that they may be called oaks of righteousness, the planting of the LORD, that he may be glorified. (Isaiah 61:3 ESV). Did you notice Isaiah called us trees? We are to be God’s beautiful oaks of righteousness, bringing glory to Him. Christ heals our broken hearts, sets us free, and so much more. Therefore, we join nature in singing, clapping, and proclaiming His glory.